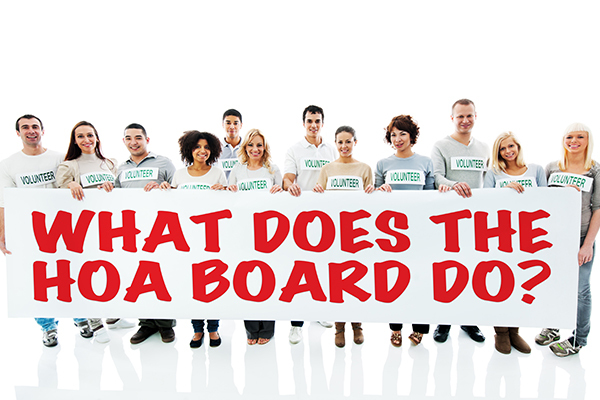 A community association board consists of volunteers elected to serve on behalf of residents to execute a wide variety of tasks. It’s a big job, but most board members are happy to serve and make the community a great place to call home. The board’s biggest responsibilities include enforcing rules, collecting assessments, and hiring help. One of the most important things the board does is enforce the association rules and regulations. Rules and regulations help community associations maintain property values and protect a quality of life. These standards are typically described in detail in an association’s governing documents, which all homeowners should have an opportunity to review before purchasing a home in a common-interest community. While some residents may not like being told what they can and can’t do, ultimately the board is looking out for the greater good. By enforcing the rules, the board is doing its best to keep property values up and conflicts down. Of course, the board wants to make sure the rules are beneficial for the majority—and hopefully all—residents. You are welcome to raise concerns about the rules at open board meetings. Before you do, come prepared to discuss background information, causes, circumstances, desired solutions, and other considerations. Another major responsibility of the board is to collect assessments from homeowners. Collecting this money is important for the financial stability of the association. The assessments pay for the common elements enjoyed by all residents. Assessments also help to replenish the reserve funds, which pay for any major repairs the association may need. The board is responsible for the association’s finances, and collecting assessments is how it ensures that the association remains solvent. Finally, the board acts on behalf of the association by hiring managers, attorneys, contractors, and other professionals who help better the association. Board members also help conceive and lead many of the projects that will improve the community. Learn more about what these volunteers do by talking to your board members, attending an open board meeting, or even running for a seat on the board during the next election. The more people we have looking out for our associations, the stronger they will be.